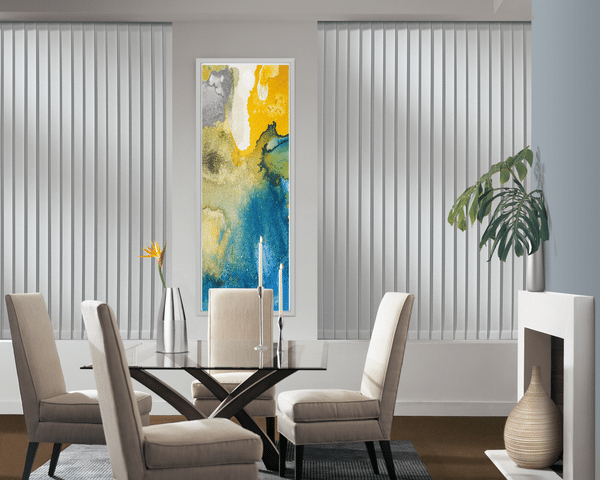 Are you shopping for new vertical blinds? 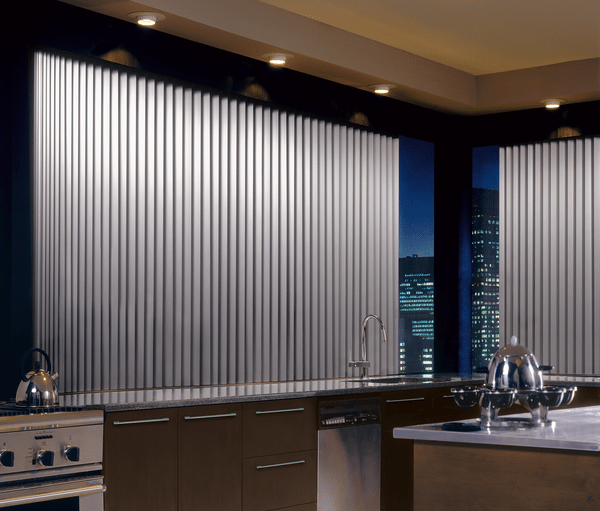 There are so many beautiful Hunter Douglas vertical blind options to choose from at United Decorators. 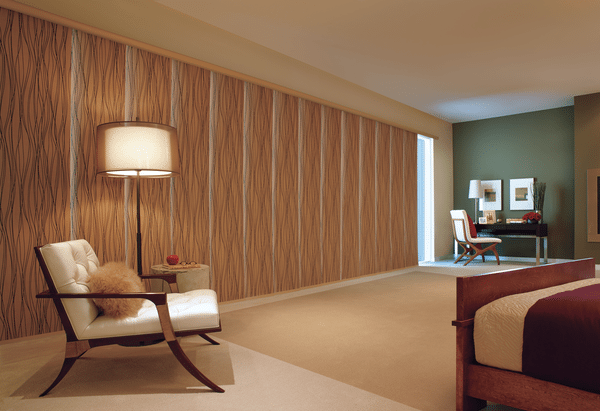 Hunter Douglas has modern and traditional vertical blinds solutions to coordinate with any room in your home or office. United Decorators recommends vertical blinds for windows with wide expanses such as patio doors or sliding glass doors. Gliding window panels, vertical blinds and the Vertiglide® systems are great window covering solutions if you’re looking for a vertical application. Are you looking for an alternative to traditional vertical blinds? 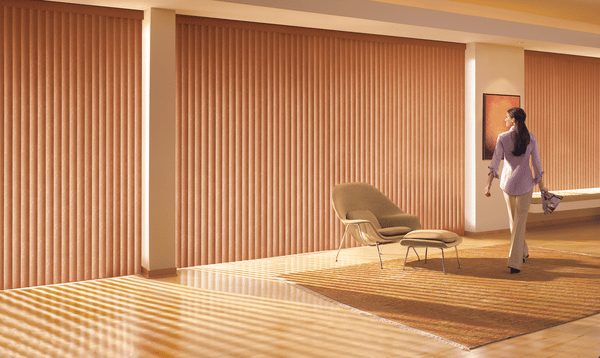 Hunter Douglas Skyline® Gliding Panels have a modern look with exquisite fabric options. Skyline® Gliding Panels are eye-catching on large window with rich colors and styles. 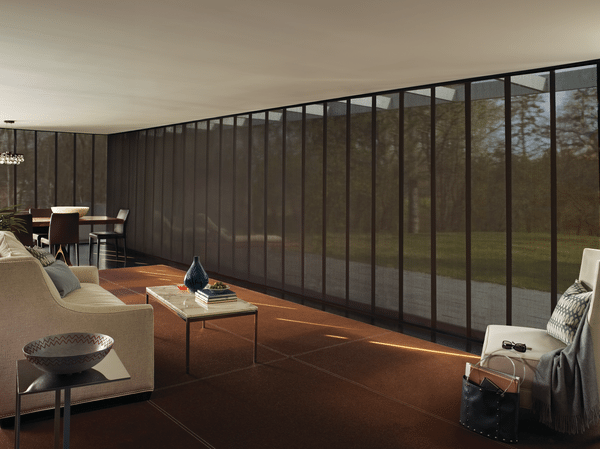 Cover your windows with a contemporary vertical blind that stacks left or right. Enjoy a great view of the outdoors and maintain privacy how and when you desire it. United Decorators has Whole House Solutions® if you are looking to cover windows with matching vertical and horizontal applications. Skyline® Gliding Window Panels coordinate well with other Hunter Douglas window shades so your entire room will look stunning. 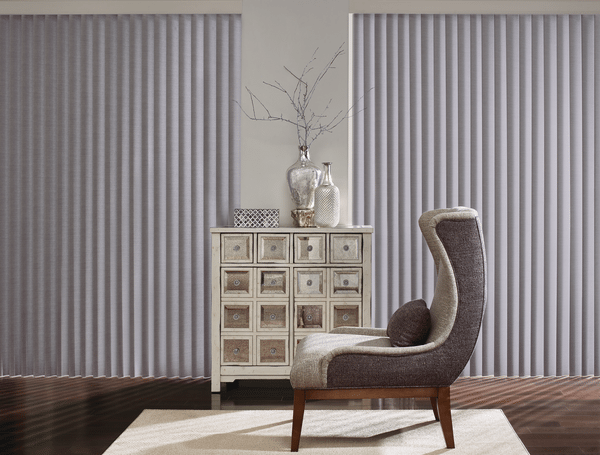 Ask how Designer Screen Shades and Designer Roller Shades look side-by-side next to Skyline® Vertical Blinds. 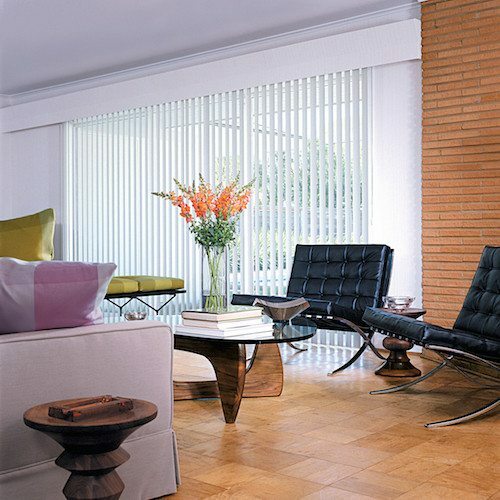 It’s the perfect combination of blinds and shades for Brooklyn and New York City homes and apartments. United Decorators will travel to New Jersey or Staten Island for a window treatment consultation too. Schedule a window treatment design consultation today. 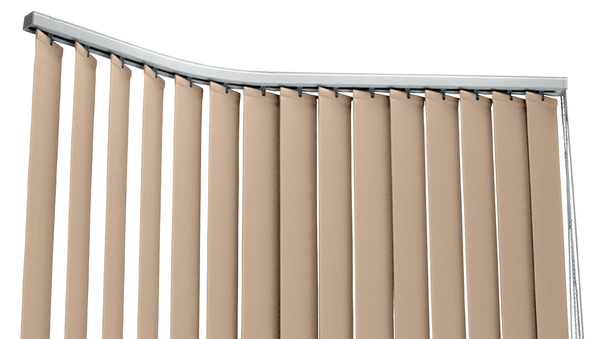 Cadence® Vertical Blinds have curved fabric vanes for a unique vertical blinds look on windows. Traditional vertical blinds tend to be flat. Hunter Douglas Somner® Vertical Blinds are hassle-free to operate, not to mention the many different colors you can choose beyond neutrals, greys, and white colors. 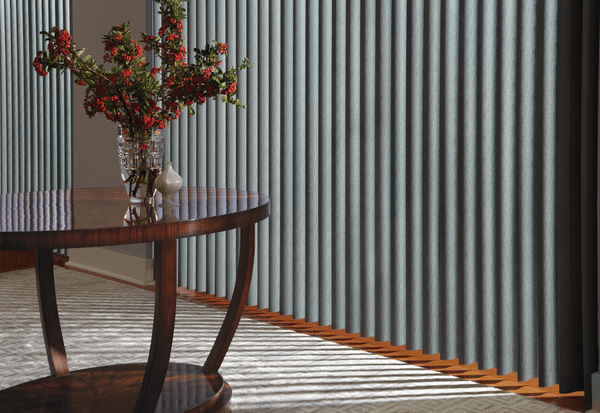 Cadence® Vertical Blinds are similar to the soft look of draperies. The curved fabric vanes have amazing sound reduction perfect for New York, New Jersey and Staten Island homes. 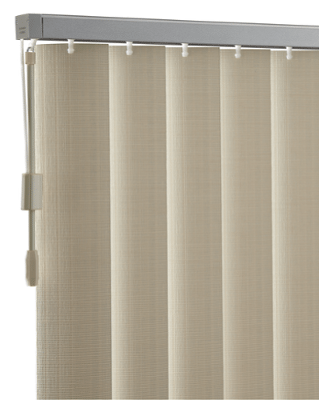 The vertical blind headrail minimizes light gaps and helps create effortless operation. United Decorators has the best and largest selection of vertical blinds to choose from. As a Hunter Douglas Gallery dealer, United Decorators has the most exclusive vertical window blind fabrics and textures. 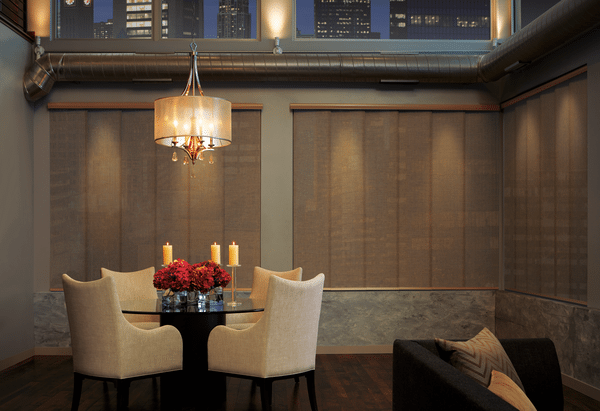 Somner® Custom Vertical Blind colors are impressive from subtle choices to bold pops and anything in between. 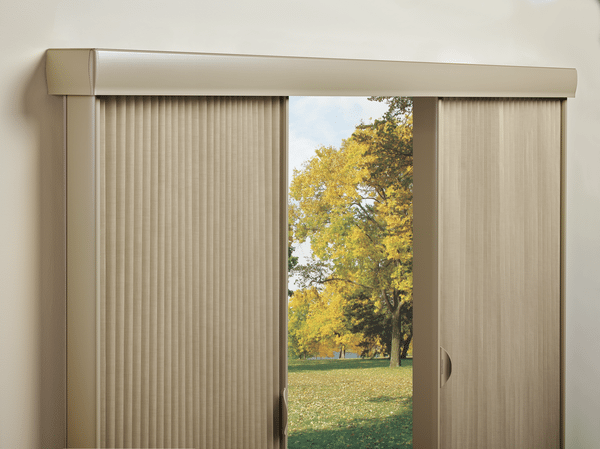 Hunter Douglas vertical blinds have the best light control options. 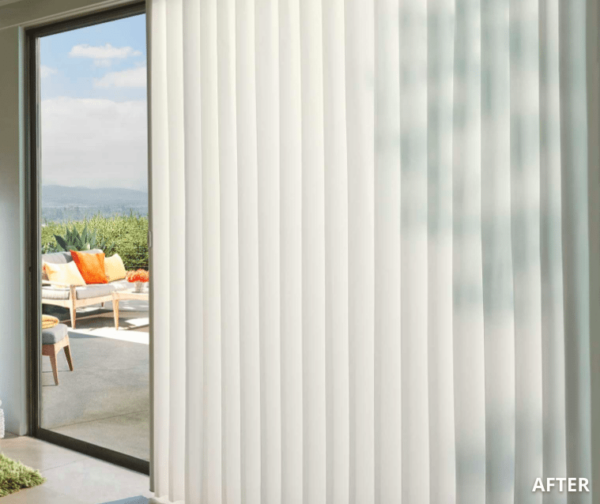 Ease of operation make Somner® Custom Vertical Blinds a perfect choice. You can choose a vinyl vertical blind vane, aluminum finish or geometric fabric pattern on your vertical blinds. 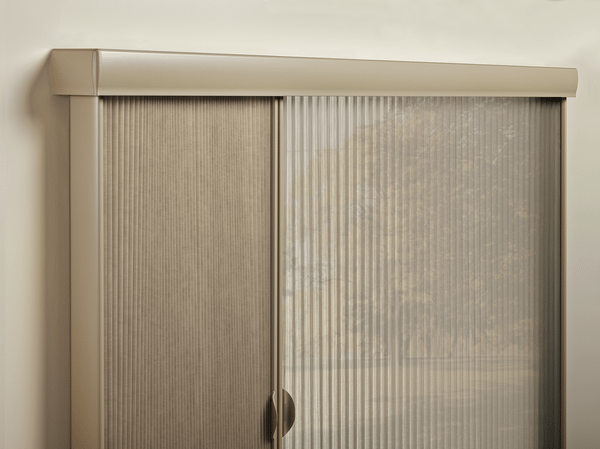 Motorize your blinds to open and close at the touch of a button with Hunter Douglas PowerView® Motorization. The fabrics on vertical blinds have come a long way. Tired of those old PVC vertical blinds clanging together or dangling around with the slightest wind gust? Maybe you just want to enhance your home environment. Whatever your needs, we can help you find the perfect blind solutions for your home or office! If you are looking for budget-friendly vertical blinds, Hunter Douglas Vertical Solutions® Vertical Blinds are available in fabric and vinyl. The colors, patterns and styles are available on specialty-shaped windows such as arched windows, angles, bay windows, corner windows and more. Vertical blinds are ideal for wide width windows in bedrooms, kitchens, living rooms, dining rooms, great rooms, media rooms and basements. The 3 ½ inch louver style has a classic look. S-shaped louvers give your room a distinct look at competitive prices. 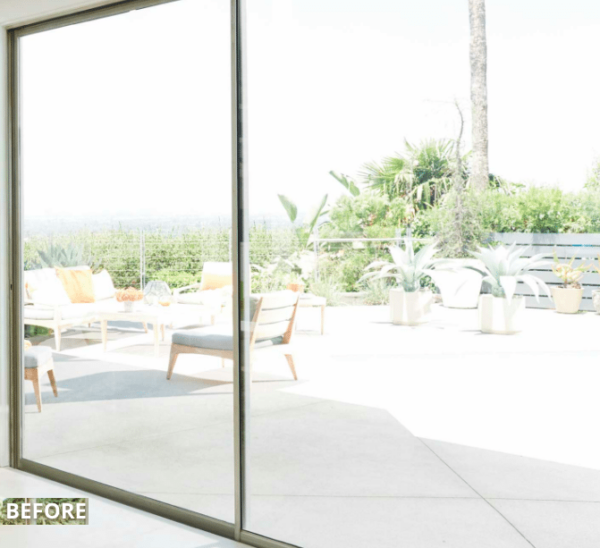 Duette® Vertiglide® is an energy-efficient window shade you can use to cover windows with wide widths. 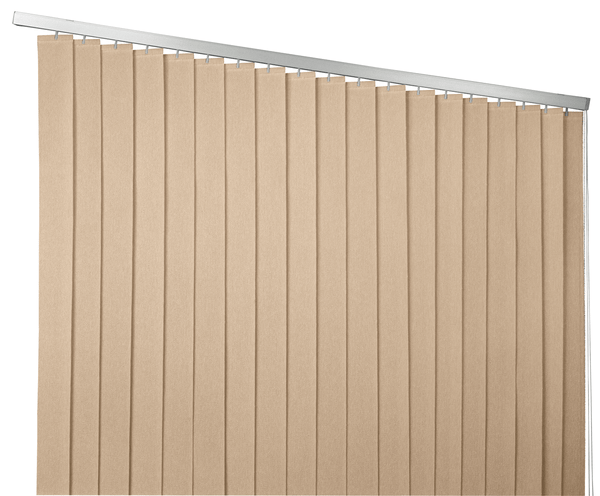 Duette® Vertiglide® is made with the patented Hunter Douglas cellular shade construction to reduce your energy bills. 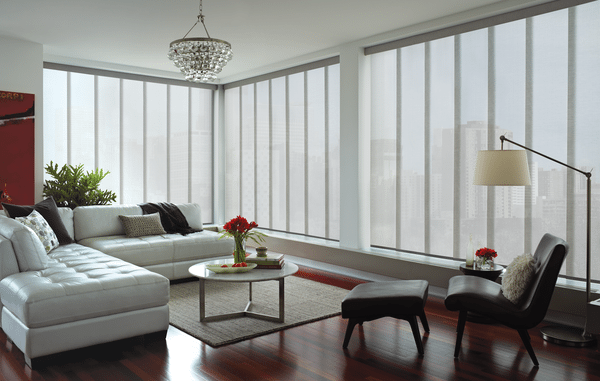 No matter what season it is in Brooklyn, New York, you will save year-round on stylish, energy-efficient blinds. Duette® Vertiglide can be used to separate one room from another. 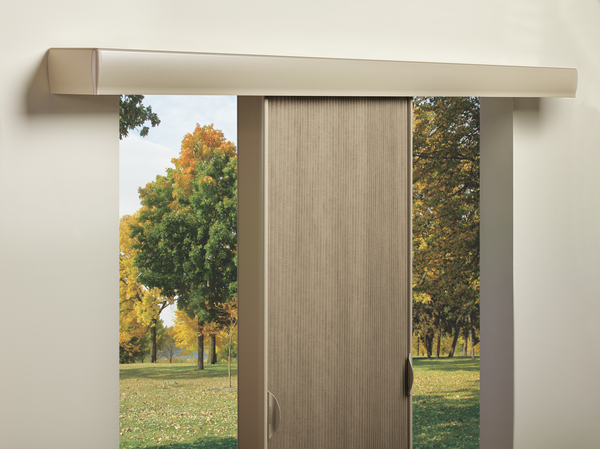 If you want to place a window covering on an open entryway without a door consider Duette® VertiGlide. Vertiglide® is great window blind solution for lofts, laundry rooms and more. Use it as a room divider most anywhere. 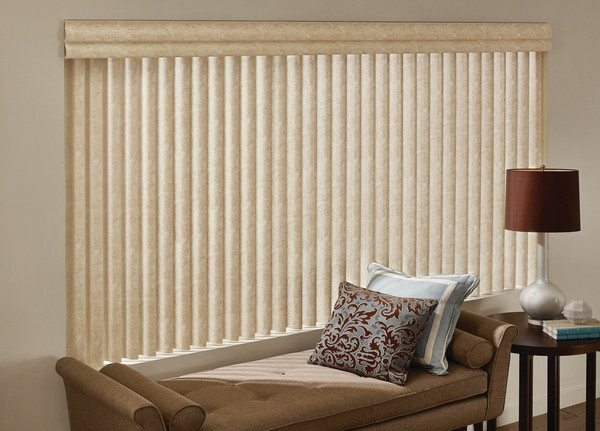 Did you know Hunter Douglas Vignette® Roman Shade fabric folds can be used on horizontal and vertical window applications? The soft folds of roman shades look beautiful on sliding glass doors or big windows. Hunter Douglas just designed new fabrics in 2018! You’ll have the latest fabric colors, textures and patterns on your windows to make a stunning design statement. 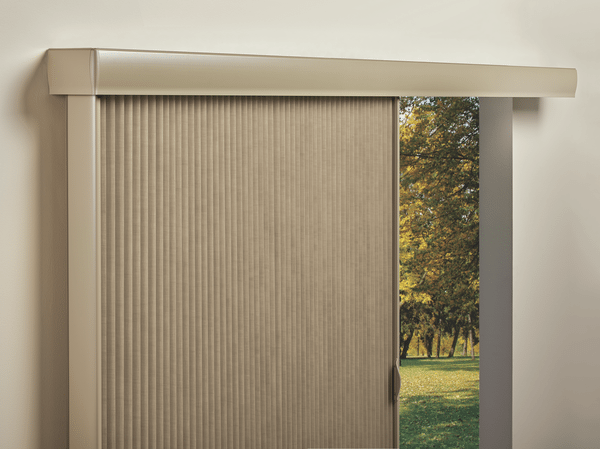 It’s easy to operate Vignette® Roman Shades with a Literise® system or PowerView® Motorization. LiteRIse® has one handle so you can slide your window shade to the right, left or leave it anywhere in the middle of your window. PowerView® is a motorized window blind system that can integrate with Amazon Echo or Google Home speaker devices. Whatever your situation may be, you’ve found the best Hunter Douglas window treatment dealer in Brooklyn and New York City to help you select the perfect vertical blind to make your room come to life. Contact United Decorators to schedule a FREE-In Home appointment or stop by the showroom to see the latest vertical blind colors, fabrics, textures, headrail, hardware and operating systems. You won’t believe how easy it is to operate your vertical blinds once you see our motorized window blinds system or cordless operating options.